It can be daunting to migrate a website to a new server, hosting company, or hosting package. There are so many things to consider, from the prospect of downtime to the nightmare of losing files or potentially corrupting key databases. Though the prospect of transferring a website fills some website owners with a sense of dread, it doesn’t have to be this way. In fact, there are three handy tricks that will minimize downtime and help to ensure a smooth transition that most users will barely notice, if they notice anything at all. By keeping these tricks in mind, website owners can preserve their website’s integrity, search engine performance, and built-in audience, without even breaking a sweat. There’s an impulse that most website owners face when switching between hosts, packages, or servers: Cancel the old plan immediately and save money during the transfer process. This sounds good in theory, but it’s actually not a great move when ensuring the smooth transfer of a website. In fact, it can have dire consequences for a website and could lead to lost files and database information. This could result in significant downtime, compromising of user accounts, and much more. So, how is this problem avoided? • Time for Testing: Running two sites simultaneously allows for comprehensive testing of all pages, files, and databases contained within the full scope of the website. It’s easy to compare both sites side-by-side, making adjustments as necessary so that file paths and links remain completely intact. • Longer Transition Time: Don’t succumb to the myth that a website must be transferred under cover of darkness, all in one night. That’s just not practical for most websites, regardless of their size and scope. By keeping the old site active while the new one is setup, website owners have a longer period of time to transfer files and make sure everything is in place. A slow, measured approach is the best one for website continuity. • No Lost Files: It’s easy to forget a file or directory folder when transferring websites, but a longer transition and testing period will reduce the likelihood of that occurring. It’ll be easier to notice a missing file if there’s at least a few days of testing and simultaneous operation. Website owners who are new to running a website or transferring its contents to a new server might believe that they have to open their FTP client and individually download each file and folder from the old site, and then upload those items in an equally slow and painful way. While this is certainly one method of getting the job done, it’s likely the slowest and the most prone to error. That’s why companies like cPanel have created comprehensive backup and restoration tools that can be used during website transfers. Backups work in a pretty simple way: When a backup is requested via cPanel or another web-based site control panel, the server zips all of the site’s files and folders into a highly compact, compressed file. This compressed file makes it easy to transfer the site’s contents, since it requires only one upload to get the job done. When the file is uploaded via the cPanel backup tool to the new website’s server, cPanel will automatically decompress the file and place all of its files and folders where they belong. In addition to making the transfer process easier, using a compressed backup file also ensures that an identical folder structure is preserved on the new server, which means there’s a greatly reduced likelihood of lost pages and “404” errors. This same backup process can be used with each MySQL database utilized by the website. Whether files are moved individually or via a compressed backup tool, one thing is consistent across both methods: Files are prone to corruption during the big move. This isn’t something that happens very often, but it’s certainly within the realm of the possible. Why does this matter? Well, a corrupted file can lead to “page not found” errors, and a corrupted database could lead to large chunks of content or user data being lost for good. The key to avoiding these nightmare scenarios is to comprehensively test the website and scan its databases. Tools like phpMyAdmin make it easy to look at a database’s rows, columns, and cells, verifying that information transferred properly when it was moved to the new server. Furthermore, simply using the site’s software, like WordPress, will quickly reveal if database or file corruption issues are preventing the site from working properly. This is another key reason to make sure that two simultaneous sites, one old and one new, are running during the transfer process. By being able to compare, contrast, and test, big problems can be solved early. Then, when the new site is fully functional and its contents are identical to the old site, website owners can change a few DNS records at night and ensure a mostly seamless transition to the new website or end users. 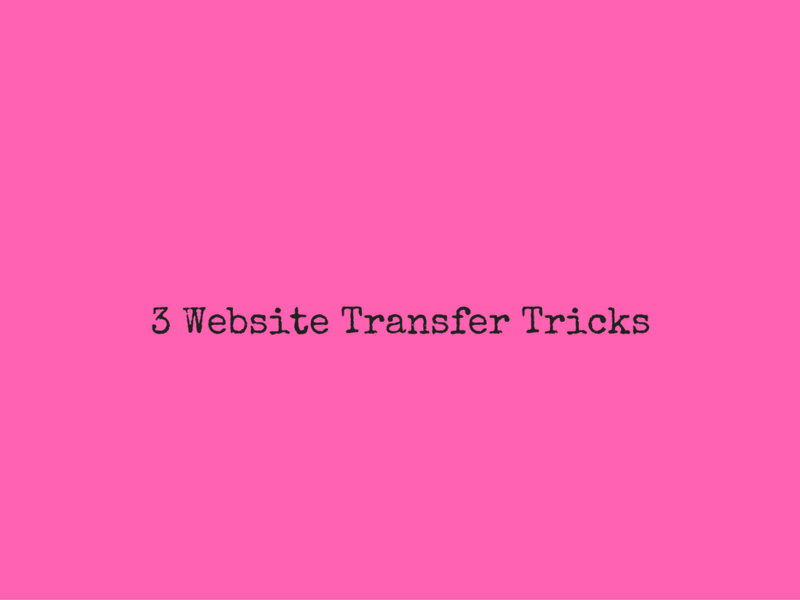 Starting to transfer your website seems daunting at the outset, but it certainly doesn’t have to be daunting at all. With careful planning, website owners can ensure the redundancy of their site during an extended transfer period, ensure a bit of database and file testing after things have been moved over, and transition end users to the new site only when it’s completely ready. This will preserve traffic, user engagement levels, and search engine performance, which are essential in today’s highly competitive world of online discussion and commerce.